The chickens are now coming home to roost for disgraced City Attorney Charles Lawrence and the Dupree Administration. Lawrence has now been sued to the tune of a $600,000 lawsuit filed by Hattiesburg citizen and Dave Ware supporter Arthur Smith. Smith, who campaigned for Dave Ware in Ware’s bid for the Mayor’s seat cast an absentee ballot for the June 4th election which was never found during the post election inspections. Smith’s envelope, application, and ballot were nowhere to be found. According to the complaint, Smith contacted Lawrence in years past over minor charges in Texas, but subsequently used a Texas attorney to handle the matters. During the trial, Lawrence ordered disgraced HPD Major Hardy Sims to pull what was an illegal, federal background check on Smith. The Dupree administration and its minions would go to any length to cling to power; even break the laws they were sworn to uphold. Disgraced City Attorney Charles Lawrence allegedly uses “precogs” to help him predict when crimes are about to happen. When challenged by the media over the NCIC federal background check, Lawrence made statements that alleged Mr. Smith had committed felonies, when in fact they were misdemeanor charges. 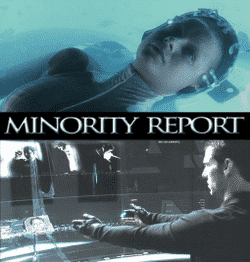 Lawrence also said he had the illegal federal background check pulled “in anticipation of a crime about to be committed.” Apparently Lawrence has a trio of “Precogs” like the ones seen in the Tom Cruise 2002 blockbuster Minority Report, which help him to predict crimes before they even occur. Lawrence’s daughter, an attorney for the Department of Justice was reported on by this blog for alleged illegal voting. According to Ms. Lawrence’s Linkedin account, she resided in Washington, DC for a number of years prior to the mayor’s race; yet cast an absentee ballot in the Hattiesburg Mayor’s election. Click here to read about City Attorney Charles Lawrence’s daughter, Attorney Chari Lawrence, alleged illegal voting. It should come as no surprise that her vote was not lost or destroyed. Click here to read the transcript from the Ware vs Dupree Trial discussing Lawrence’s disgraceful actions in the judge’s chambers. Click here to read allegations of City Attorney Lawrence covering up crimes in the Dupree Administration. Read Arthur Smiths full complaint is below.